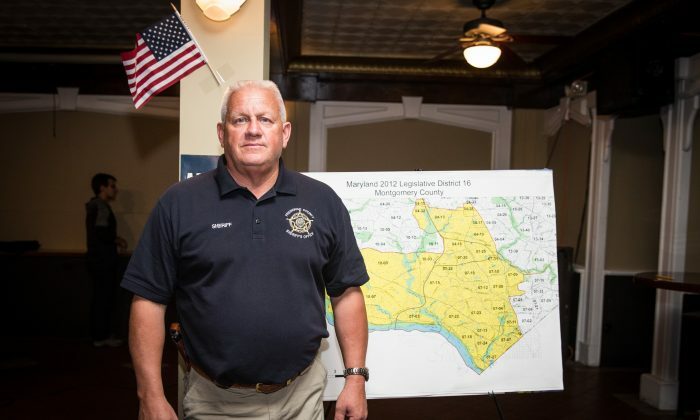 BETHESDA, Md.—Sheriff Chuck Jenkins swears by the 287(g) program, calling it a “force multiplier” for immigration enforcement and an effective way to keep criminals off the streets. The 287(g) program was added to the Immigration and Nationality Act in 1996 under President Bill Clinton, and is a cooperation agreement between Immigration and Customs Enforcement (ICE) and a state or local law enforcement agency. Under the agreement, designated officers are trained and supervised by ICE to perform some immigration law enforcement functions within jail settings. 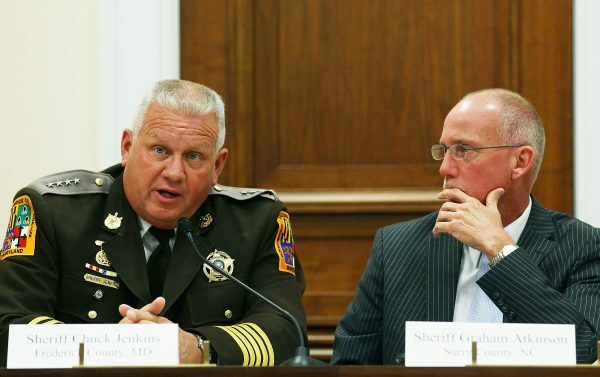 When Jenkins was elected sheriff for Frederick County, Maryland, in 2006, one of his priorities was to join the program. Jenkins said the added workload for his department is negligible and ICE handles all the costs. As a sheriff, I have an obligation to do everything within my power … with the legal means I have, to use every program, every resource, every tool to do what I can to protect the citizens of my county. “Really, what we do is facilitate a process. We help ICE in determining their [an inmate’s] immigration status,” he said. If here illegally, they are usually placed in deportation proceedings by ICE. If the detainee answers anything other than “the United States,” an immigration status check is conducted using the federal database. Jenkins said most people are honest, because they know that the consequences of lying are far greater. Deputies never ask an individual’s immigration status while responding to an incident, while on a traffic stop, or while conducting an investigation, Jenkins said. “I guarantee you … nobody is out there asking questions about immigration status on the street. It just simply doesn’t happen,” he said. Nationwide, many jurisdictions have created so-called sanctuary cities, which ban or limit local law enforcement from cooperating with federal immigration authorities. These sanctuaries refuse to alert ICE when an inmate is being released, or refuse to hold an inmate for up to 48 hours longer in order for ICE to take custody—even when ICE issues a federal detainer warrant. Last month, ICE arrested a convicted felon in New York after the NYPD had refused to honor the detainer request lodged by ICE and released him. Pablo Garcia-Taveras, 45, a Dominican national, was previously convicted of felony criminal possession of a controlled substance and felony attempted criminal possession of a controlled substance. He had also previously been deported twice. 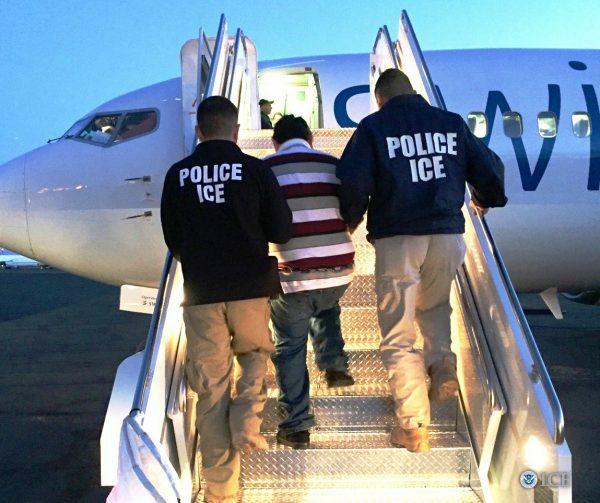 “Every day, our officers put their lives on the line to arrest criminal aliens who could have easily been transferred to ICE custody within the confines of a secure jail environment,” said Thomas Decker, field office director for ICE’s Enforcement and Removal Operations in New York. Jenkins said he doesn’t view ICE detainers any differently than those from other agencies, like the FBI, the U.S. Marshals, or the Bureau of Alcohol, Tobacco, Firearms and Explosives. “We’re going to honor their detainers, we’re going to honor their requests with holds on prisoners,” he said. In September, ICE arrested almost 500 individuals in sanctuary jurisdictions that deny ICE access to jails and prisons to interview suspected immigration violators, or that do not honor ICE detainers. Of the 498 individuals taken into custody, 317 had criminal convictions, 68 were immigration fugitives, 104 were previously deported criminal aliens, and 18 are gang members or affiliates, according to ICE. Jenkins said some politicians in his local city election have been talking about making Frederick a sanctuary city. Jenkins is elected directly by the people in Frederick County, rather than by the county executive, which is the case in other counties, such as neighboring Montgomery County. That gives Jenkins the freedom to join programs such as the 287(g) without political interference. However, he said, County Executive Jan Gardner has told him she doesn’t like the program. The original 287(g) program included a task force component, under which local 287(g)-designated officers were authorized to carry out immigration enforcement actions on the street. Under the task force model, officers could question individuals about their immigration status, serve warrants for immigration violations, and issue immigration detainers. The task force part was stripped out in 2009 by the Obama administration, and 287(g) now just includes agreements that involve cooperation within jails, prisons, and detention centers. Since 2008, when Frederick County joined the program, the sheriff’s department has cooperated with ICE with 1,525 individuals who were identified as being in the country illegally and committing crimes in the county, Jenkins said. Jenkins said that of the roughly 1,400 people, 67 were validated gang members, and of them, 18 had some type of specialized training, such as sniper or commando training, or they were martial artists, knife fighters, or trained assassins. “They’re the type of people that are coming across our borders and happened to infiltrate and get to this part of the country,” he said. Jenkins said it doesn’t take a 287(g) agreement to cooperate with ICE. Jenkins said the citizens of Frederick County are “by and large” overwhelmingly supportive of his department. He said the serious crime rate in the county, as categorized by the FBI and Department of Justice, is less than half of the national average. “I’m not tying that directly and solely to our participation with ICE in the program, but that certainly plays a part,” Jenkins said. Jenkins said the 287(g) program gets a bad rap from media and advocacy groups, mostly because they misconstrue what the program does, and doesn’t, do. Most politicians in sanctuary jurisdictions say that cooperating with ICE creates a “chilling effect” in immigrant communities—meaning victims and witnesses of crime stop coming forward because they are afraid of being deported. However, protections such as the U-visa already exist for illegal aliens who are victims or witnesses of crime. And law enforcement officers don’t ask the immigration status of witnesses and victims of crimes, unless they themselves have been arrested for a crime. Beyond only operating in jails, the 287(g)-designated officers are able to issue prosecutorial releases, which means an illegal alien could avoid being placed into deportation proceedings. Jenkins said his department has issued 204 prosecutorial releases since 2015. Aside from the cost of sending deputies and corrections officers to South Carolina for training, there is no ongoing cost to the sheriff’s department. “Not one dollar of Frederick County taxpayer money goes into that program,” Jenkins said. He said ICE pays for everything, including the training, the computers to do the database checks, the fingerprinting equipment, the language lines for interpretation, and the transportation of detainees. Jenkins said his department could not have a better relationship with ICE. Two other counties (out of 23) in Maryland—Harford and Anne Arundel—have 287(g) agreements with ICE. In total, ICE now has agreements with 60 law enforcement agencies in 18 states—almost double the number of active programs in 2016, according to data on ICE’s website.